Over the past 8 years, you’ve made Flickr your home for more than 7 billion photos. We here at Flickr HQ are constantly amazed by the places you’ve been, the moments you capture, and the millions of stories that are told through your images every day. Today, we’re excited to announce a new feature that will make it even easier and faster for you to upload your photos and share them with the people who matter to you. Introducing the new Flickr Uploadr! We’re utilizing some advanced HTML 5 browser technology to bring you a completely new uploading experience on Flickr. You can now add photos by dragging them into the browser. We also show preview thumbnails, where supported, so you can use the intuitive drag and drop interface to manage and reorder photos before they hit your photostream. 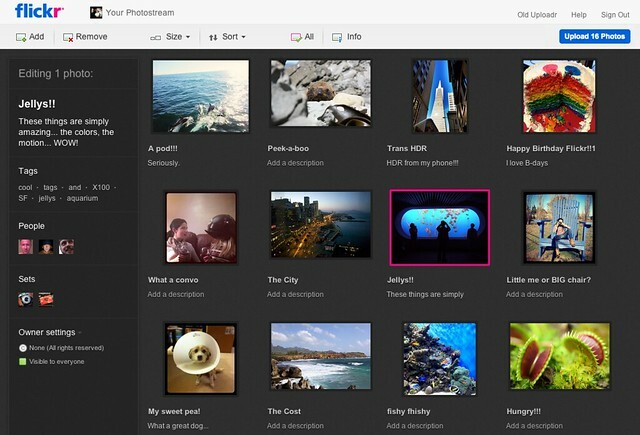 You can also easily zoom, rotate or sort your photos by title. We’ve made it even easier for you to add titles, descriptions and tags, and you can organize your photos into sets like Death Valley 2012 or Beards of my Life. You can now also tag your friends in photos and change licensing, content type and other advanced options right from the uploadr page before publishing to your photostream. So go ahead and tell everyone about your photos! You may also notice a huge improvement to our upload speeds – between 20-30% faster on average, and up to 50-60% faster for some of our international users. File sizes: now more bigger! You asked for it, and we’ve delivered. We increased the file size limits for our Pro users up to 50MB and for our free users up to 30MB. That’s huge! 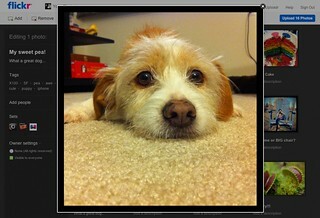 Now you can easily save high-resolution images to Flickr and see your photos in pixel-perfect detail. But wait, there’s more! We’re still hard at work on even more features for the Flickr Uploadr. Check back often to see what else we have in store for you and keep letting us know what you think of the new Flickr. We’ll be rolling out this feature to our users over the next couple weeks, so don’t worry if you don’t have it yet – it will be your Upload experience by default soon. For more information check out our handy list of FAQs, and please let us know if you have any bugs or feedback to share with us. 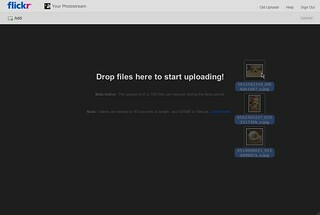 If you’re interested in the technical bits of how we made the Uploadr work, also check out this awesome post on the Flickr code blog. *Currently, we are supporting versions of Chrome 6, Safari 5, Firefox 8 and up.